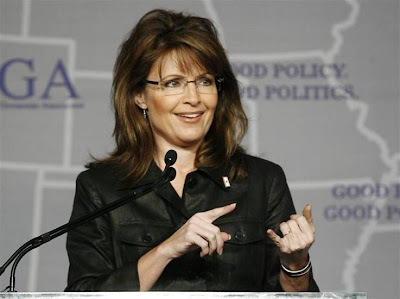 A Time For Choosing: Sarah Palin: Troubling Questions Remain About Obama's Health Care Plan. We Give The Final Word (Hopefully) On "Death Panels"
Sarah Palin: Troubling Questions Remain About Obama's Health Care Plan. We Give The Final Word (Hopefully) On "Death Panels"
The big discussion in health care, thanks to Sarah Palin, has been those metaphoric "death panels." Now, I have to laugh out loud because the NYC/D.C. Beltway "elites" with their Ivy League educations have failed again to grasp common sense! 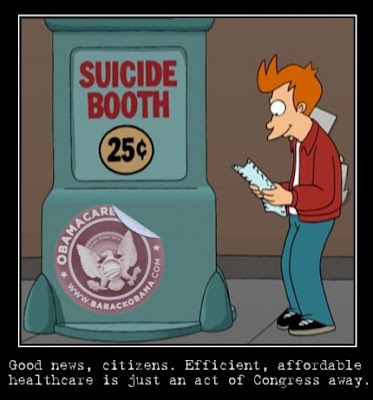 By now you have heard that key Senators in the Senate Finance Committee are saying they will take out certain "end of life" provisions of Obama’s disastrous health care fiasco. "See, those death panels we swore were never there, now they're gone!" The end of life "counseling" was troubling, for sure, and we have found cases in Oregon where cancer patients were offered suicide drugs, but not cancer treatments. Oregon has statewide socialist medicine as well as assisted suicide laws. It seems that many progressives are members of the Hemlock Society. Folks, let me be clear. "Death panels" is a metaphor. You see, those "death panels" are not the end of life counseling, or anything associated with them. Obama claims you can and that he will. But that's a provable lie. The place had been there since 1947 and the owner/cook/server/cashier was a real character. You went in, placed an order, which oddly enough, was called "an order." "An order" consisted of roughly ½ pound of beef, however much bread he grabbed, and a coke! This was served on butcher paper, with no silverware, no napkins, no nothin’! He just served it up, and his helper, would take it, and you, to a long table where everyone sat. Pickles and onions could be had if you asked and if he thought you needed ‘em! "Might as well tell them folks to go on over to the Chicken Shack and get a table, I’ll be over there myself pretty quick!" So, at some point, folks will sit down and start looking for ways to save money, and cut the back load of patients. They will do this by cutting back on services and denying services to those they determine "not worth the effort." And there is your "death panel." They will be called "advisory boards" and have names like: "Standards and practices" or "patient care panels" or whatever Orwellian name they can come up with. Before you read Sarah’s statement, Ronald Reagan, way back in 1961, was part of the famous "Coffee Cup Campaign" to stop socialized medicine. It was a bad idea then, it’s a worse idea now! As I noted in my statement last week, nationalized health care inevitably leads to rationing. There is simply no way to cover everyone and hold down the costs at the same time. The rationing system proposed by one of President Obama’s key health care advisors is particularly disturbing. I’m speaking of the "Complete Lives System" advocated by Dr. Ezekiel Emanuel, the brother of the president’s chief of staff. President Obama has not yet stated any opposition to the "Complete Lives System," a system which, if enacted, would refuse to allocate medical resources to the elderly, the infirm, and the disabled who have less economic potential. Why the silence from the president on this aspect of his nationalization of health care? Does he agree with the "Complete Lives System"? If not, then why is Dr. Emanuel his policy advisor? What is he advising the president on? I just learned that Dr. Emanuel is now distancing himself from his own work and claiming that his "thinking has evolved" on the question of rationing care to benefit the strong and deny the weak. How convenient that he disavowed his own work only after the nature of his scholarship was revealed to the public at large. Our senior citizens are right to be wary of this health care bill. Medical care at the end of life accounts for 80 percent of all health care. 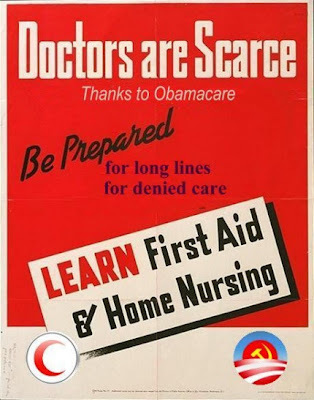 When care is rationed, that is naturally where the cuts will be felt first. The "end-of-life" consultations authorized in Section 1233 of HR 3200 were an obvious and heavy handed attempt at pressuring people to reduce the financial burden on the system by minimizing their own care. Worst still, it actually provided a financial incentive to doctors to initiate these consultations. People are right to point out that such a provision doesn’t sound "purely voluntary." I agree. Last year, I issued a proclamation for "Healthcare Decisions Day." The proclamation sought to increase the public’s knowledge about creating living wills and establishing powers of attorney. There was no incentive to choose one option over another. There was certainly no financial incentive for physicians to push anything. In fact, the proclamation explicitly called on medical professionals and lawyers "to volunteer their time and efforts" to provide information to the public. Comparing the "Healthcare Decisions Day" proclamation to Section 1233 of HR 3200 is ridiculous. The two are like apples and oranges. The attempt to link the two shows how desperate the proponents of nationalized health care are to shift the debate away from the disturbing details of their bill. It is time to recruit a mandated E-Verify, a part of the SAVE ACT in the extraction of foreign nationals from any business, throughout the United States. We should also recognize it as a major deterrent against other sections of fraud, against federal, state and other government entitlements. For decades welfare has been involved in fraudulent benefit conversion to individuals or groups. Progressive, modified E-Verify will remove the stigma of some--BUT NOT ALL--corruption in the programs, meant as a safety-net for citizens and permanent residents? This is why parasite businesses that use--cheap labor--have been at the fore-front of nullifying any immigration enforcement program, with the assistance of a many politicians who have been brought and sold with campaign contribution and other questionable monies. Millions of angry voices have caused a remarkable change on the leadership in Washington. Have made them address E-Verify as a positive tool in the minimal arsenal of immigration law enforcement. For once the uppermost politicians have ignored the demands of corporate profiteering because of the deafening vocal blast from an irate population. However, we must not drop our guard for one minute towards those who legislate the laws, as a gap in our armor will bring down upon all taxpayers billions of dollars to support illegal immigrant families. Taxpayers have been the supplier for years without any relief, as corporate welfare recipients--WHO PAY NOTHING--to their upkeep. The fight is far from over as the oncoming months will bring to the capitol chamber another rush towards AMNESTY. Another AMNESTY means even more millions breaking our laws, to take advantage of our plentiful government entitlements. It means overcrowded schools and even more cramming our already saturated hospitals--NOT TO THE MASSES IN THE CRIMINAL PENAL SYSTEM. We are already the deep pockets for illegal immigrant families in the mandatory emergency room. We as a nation can no longer afford to underwrite the poor of other countries, who break our sovereign laws, as the bill is already in the trillions of dollars according to the Heritage foundation. What we need is an orderly recruitment of highly skilled professional engineers and scientists and not those who will become public charges. We must do all we can to reduce illegal immigration. Complete a national two-layer border barrier as originally designed, upgrade the regional police law 287 G federal laws, introduce E-Verify enforcement inspections auditing companies--big and small. Propose a reward to the public who notifies ICE of illegal immigrants in the workplace. No weakening of ICE raids on suspicious businesses around the country. TIME WE TOOK OUR NATION BACK! Keep the politicians feet to the raging fire and call 202-224-3121. All your question answered relating to corruption and lies at NUMBERSUSA AND JUDICIALWATCH. BE AWARE THAT OVERPOPULATION WILL BE AN IRREVERSIBLE ENVIRONMENTAL NIGHTMARE? For decades Europe has been a beneficiary of excellent nationwide health care. It wasn't until the early 1960's that the English/British single payer system started to erode. This was caused be the introduction of legal immigration imported to drive London Buses and work on the railways. Deterioration has increased since the inception of the European Parliament dictates of the free flow of immigrants from impoverished nations of Northern Europe that has overrun the health care system. When I lived in England their was no co-pays, deductions or premiums, just insurance stamps that the employer and employee paid. I received 3 surgeries with no further cost to me. There was no anguish about debt collectors calling or ending up in front of a bankruptcy judge. As a child and a young man I choose my doctor and received eye and dentistry visits free of charges. One should remember that there a large majority of nefarious special interest groups, who enjoy the status quo and will fight with propaganda and lies against their profiteering. Another place where I lived was Australia, where the health care system is equally as great as England. One year I was employed by Australian Main Roads as a junior surveyor and stepped into a fire ants nest, ending up in hospital. Once again my cost was--ZERO--because I paid into the system. There is something very calming, without the worry of billing statements pouring through the mailbox demanding money and threatening you with an attorney. I love the footnotes. Did you also write Sarah's footnotes? Universal healthcare is in every first world civilized country apart from the US.. and you are the sickest population in comparison.. don't you see this as the single inevitable truth? Brittanicus, I'm sure Britain's NHS may have been fine at one time, but it is now a disaster. Long waits, denied care, and severe rationing. Britain recently passed a law that set a time limit an emergency patient could be left waiting in the que before they must be seen. So the solution was not to hire more workers, of work faster, instead, they are leaving patients in ambulances for as long a 8 hours, BEFORE they start their time in the ER waiting room! That, plus unsanitary conditions, and other issues. Wouldn't trade American health care for anything at all. The problem in this country, basically is tort. We have way too many blood sucking lawyers looking to get paid. They are even advertising for clients nationally. We need serious tort reform, and limits set on rewards an attorney can win for his client. All of these lawsuits impact the cost of health care in many ways. One, doctors are forced to run many extra tests to cover their butts in case they are sued. Also, the cost of malpractice insurance for doctors and hospitals is incredible, and of course adds to the cost we pay. Comprehensive tort reform would reduce costs tremendously, saving billions. The other problem, as you mention is illegal aliens. Now the 45 million uninsured number the democrat/communist party throws out there is an out and out lie, but everyone knows they lie when the truth would work better, so you just kinda factor the lie in. But we do know we have somewhere between 15-25 million illegal aliens in this country. They drain billions of dollars in heath care services that have to be made up by raising the cost to Americans who must pay for their services. Tort reform, and sending the illegals home would cure 90 percent of the issues we have. The problem is, the democrat/communists are in the trial lawyers' back pocket, and the democrat/communists are trying to figure out a way to allow the illegals to vote for them. So, as long as there are democrat/communists, the problem will never be fixed! Ernesto, thanks....But no, Sarah Palin writes her own footnotes. The portion after my commentary is published verbatim from her statement. Sarah is very good at doing research, and during this debate has provided great footnotes to back up her conclusions. Having studied her days as Governor, I can tell you, copious research on any given subject is standard fare for her. She's not one to give opinions on things she aren't familiar with. That's why so many people are impressed with her. Phillip, Michael Moore is not a credible source of information. "Sicko", like his other schlockumentaries are pure propaganda.